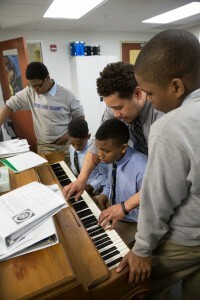 Students who attend Chicago Jesuit Academy will be the next generation of leaders in the City of Chicago. Therefore, talented men and women who wish to be employed by Chicago Jesuit Academy as teachers or staff must demonstrate a past and continued commitment to academic excellence, professional development and the best ideals of the Roman Catholic faith. Strong candidates for teaching and staff positions are disciplined workers, compassionate listeners and tireless advocates for the young men they serve. Most importantly, they approach their work as a vocation. The success of our students hinges upon the determination and excellence of our faculty and staff. As a full-scholarship middle school, Chicago Jesuit Academy succeeds because of the generous sacrifices made by our students, parents, faculty, staff, volunteers and benefactors. Strong faculty and staff candidates will have knowledge of the Ignatian Pedagogical Paradigm and believe in an education that forms the whole person—cura personalis in the Jesuit tradition. Candidates are strongly encouraged to review the Ten Fundamental Principles of a Jesuit Education at Chicago Jesuit Academy and the following document on Ignatian Pedagogy prior to submitting a formal application.